Since 1978 China has seen the most rapid economic growth of any country in world history, and the most rapid growth of living standards of any major economy. Following the beginning of the international financial crisis China has far outperformed any other major economy – in the six year from 2nd quarter 2007 to 2nd quarter 2014 China’s economy grew by 78% and the US by 8%. In a single generation China has gone from a ‘low income economy’ to the verge of achieving ‘high income’ status by World Bank criteria. China achieving ‘high income’ status will double the number of people living in such economies globally. This extremely rapid development is sometimes explained in terms of unique ‘Chinese characteristics’, but economic research over the last 30 years shows that the reasons for China’s economic growth are rooted in universal economic processes. Therefore, while the combination of global forces producing economic growth is unique in China, and produces unique ‘Chinese characteristics’, the forces propelling China’s growth operate throughout the world economy. Other countries can therefore learn from China’s economic success. The importance of China’s economic success is evident for developing economies – if most other developing economies could achieve the scale of China’s economic success global problems of poverty and its consequences would be solved. China’s economic success also has decisive lessons for developed economies – China’s policy response to the international financial crisis was far more effective than that of other major economies. This paper examines the chief strategic lessons to be drawn from China’s success for the G20 economies. China’s growth in absolute terms in a single year far exceeds any other country in history. Measured at internationally comparable prices, i.e. parity purchasing powers (PPPs), adjusted for inflation, the greatest absolute increase in GDP in a single year ever recorded outside China was by the US in 1999 when it added $567 billion in output. The highest increase in production every achieved in a single year by Japan, frequently thought of as a post-war ‘miracle economy’, was $212 billion. But in 2010 China added $1,126 billion in output.China’s GDP increase in a single year was more than twice that ever achieved by the US and five times that of Japan. 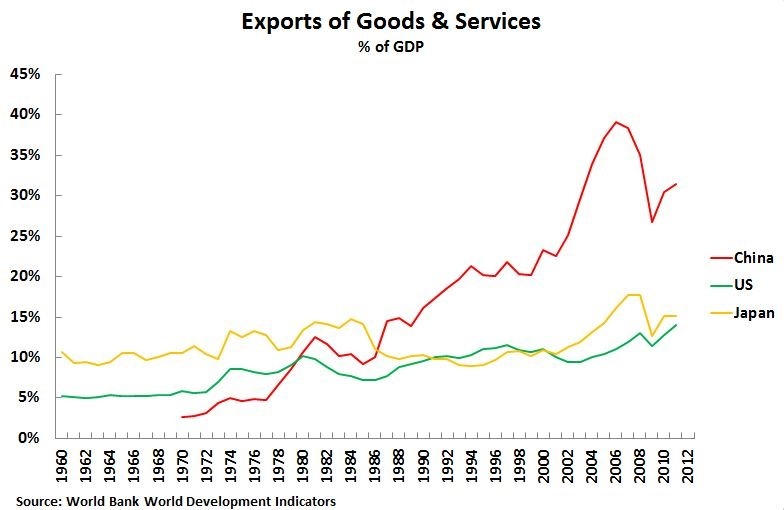 China’s rapid growth has transformed its place in the world economy. Indeed, the scale of this transition is frequently underestimated, due to use of a misleading method of categorising and ranking countries without taking account of their population. This illogically gives the same weight to Monaco, a country with a population of under 40,000 and a higher per capita GDP than China, and India with a population of 1.2 billion, or Indonesia with a population of nearly 240 million, and lower per capita GDPs than China. This has the effect of confusing, not clarifying, China’s real position in the world economy. Serious calculations of China’s position in the world economy must take population into account. 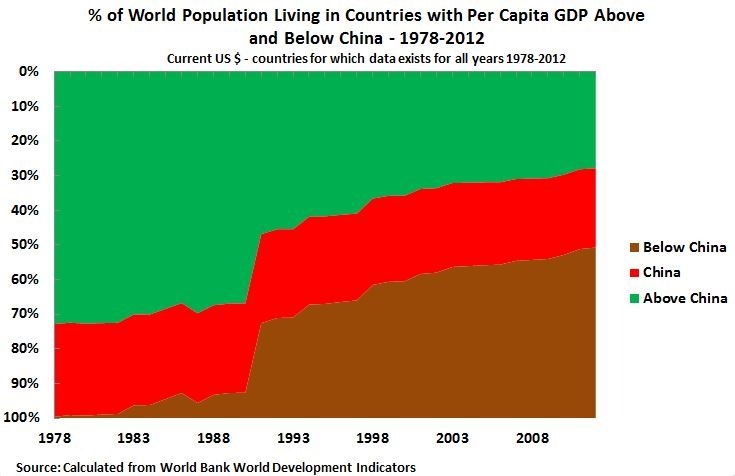 Making calculations in terms of world population, when China’s ‘reform and opening up’ began in 1978 less than 1% of the world’s population lived in countries with a per capita GDP lower than China’s – 74% lived in countries with a higher GDP per capita measured in current dollars. By 2012 the situation was transformed – 29% of the world’s population lived in countries with a higher GDP per capita than China and 51% lived in countries with a lower GDP per capita – Figure 1. China had therefore moved into the top half of the world’s population in terms of economic development, with less than a third of the world’s population living in more economically developed economies. No comparable improvement in the position of such a large proportion of the world’s population has ever previously taken place in human history. In addition to this long term growth, China has come through the international financial crisis far more strongly than any other major economy. 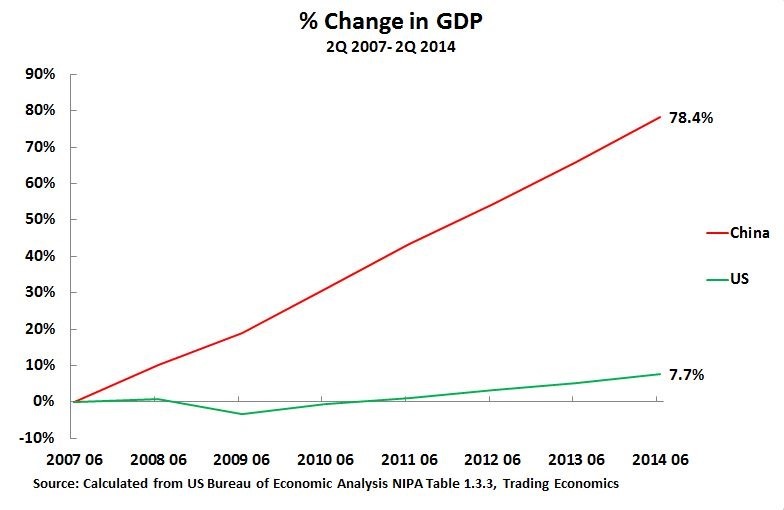 Between the 2ndquarter of 2007 and the 2nd quarter of 2014 China’s economy grew by 78% compared to 8% for the US – and the US was the best performing of the major developed economies. Therefore not only was China’s long term growth performance higher than that of other economies but its short term anti-crisis macroeconomic policies were also superior to those of any other major economy. This unprecedented scale of China’s economic success evidently leads to the question of how applicable are lessons from China to other countries? This, in turn, immediately encounters the preliminary issue of whether China’s economic development was wholly specific, in which case few if any lessons can be drawn by other countries, or whether it was based on economic forces operating globally – in which case other countries can learn lessons from China. After the People’s Republic was established, we had more than seven years of successful socialist reform and construction. But then, the domestic and international situation, plus the combined influence of our victories, inflated self-confidence, and overheated brains, engendered inside the Party a kind of joyous arrogance. An exaggerated estimation of our accomplishments, plus an eagerness to speed up the progress… further stirred unrealistic thinking and opened a broad avenue for impetuous surges in violation of the laws of economics. we can never be too careful when it comes to the application of a foreign theory, because with different preconditions, no matter how trivial they seem, the result can be very different. This emphasis on specificity is correct. In fact, to pose the issue in the most general terms, not merely is each country different, but each country is itself different at each point in time – specificity is not only geographic but chronological. Not only is Germany not China, but China in 1949 is not China in 2014. In the famous and correct dictum of Heraclitus, nobody ‘ever steps in the same river twice’. Nevertheless, simultaneously with this insistence on the entirely specific character of China’s development, Deng Rong’s passage speaks of ‘laws of economics,’ and ‘laws’ by their nature are universal. Deng Xiaoping stated this clearly by speaking not only of China’s specific character, its ‘Chinese characteristics’, but also that: ‘We have tried to act in accordance with objective economic laws.’ Is there, therefore, a contradiction between the simultaneous assertion of the entirely specific character of China and of ‘universal’ economic processes? In reality there is no contradiction between the idea of China’s uniqueness and of universal/global elements. Any practical economic analysis is not of an abstract idea but of a material reality. The fundamental structural elements of every economy (consumption, investment, savings, primary industry, manufacturing industry, service sector, trade, money etc.) are universal. But the specific way in which these universal elements combine and are interrelated in any economy is entirely unique both in place and time. It follows from this no country can copy another. If one country applies the same policy as another, in what is inescapably its own and therefore a different situation, it is necessarily making a mistake – not only the other country’s situation but its own is specific. But, equally, a country can learn from others, as China did, by analysing the elements of which other economies are composed, and analysing how these elements combine differently in its own specific situation. Deng Xiaoping, and the other architects of China’s economic reform, were therefore accurate in stating simultaneously that China’s policies were wholly specific and that they were acting in accordance with ‘universal’ economic forces. 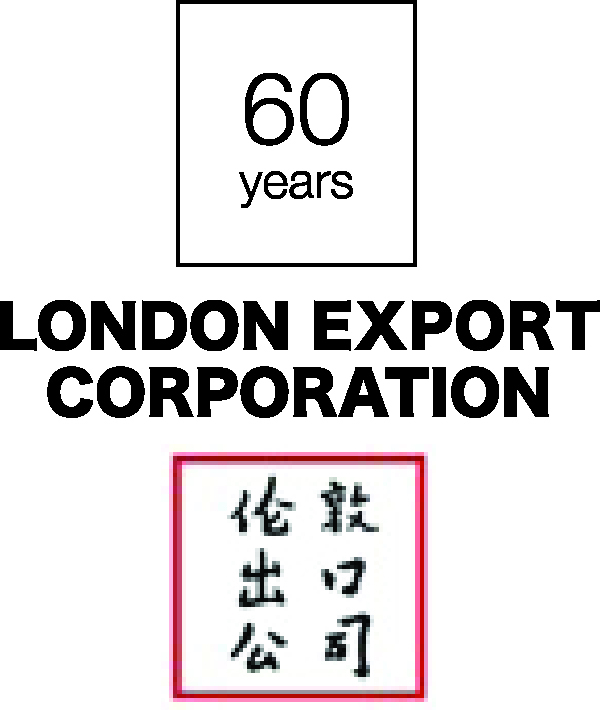 It therefore follows that other countries can learn lessons from China’s economic development – not in terms of mechanically copying policies, as the specific form of these is determined by the unique situation of China, but in terms of analysing the universal/global elements of which China’s economic policy is composed, and understanding how these combine in the unique conditions of another country. ii. To analyse the specific combination of these elements in China. It is this fact that, while China’s economic policy is entirely specific both in time and place, nevertheless it is composed of elements which are universal and global in character, which allows lessons to be drawn by other countries from China’s experience. However to analyse these ‘universal’, that is global, elements accurately it is necessary to grasp advances in understanding of the causes of economic growth, and its measurement, in the last decades. In the last three decades major advances in measurement of the causes of economic growth have taken place, leading to clearer understanding of economic growth in general and also the causes of China’s economic growth. These advances, which are now formally recognised by the UN, US, and OECD may be briefly summarised. The formalisation of the study and measurement of the causes of economic growth, technically known as growth accounting, was carried out in the 1950s by Robert Solow. Solow himself primarily considered two inputs, capital and labour, but a strength of his framework was that other inputs can and have been added. In his ground-breaking papers Solow, however, made two errors which were corrected later by others and which are directly relevant to analysis of economic growth in general, of China and Asia’s economic success, and therefore of conclusions that may be drawn from it. First, Solow did not include ‘intermediate products’, the unfinished inputs of one industry into another, in his analysis. This was crucial quantitatively because factual study shows intermediate products grow even more rapidly than capital, labour, and productivity during economic development. This rise of ‘intermediate products’ is an index of the growing division of labour domestically and internationally. Second, Solow’s calculations made the error of not taking into account improvements in the quality of investment and labour. This led to the erroneous conclusion that the majority of economic growth came from productivity increases – an error repeated in some discussions of China. This latter mistake was subsequently corrected, and accurate methods of calculating growth were formally adopted by the US, UN and OECD. Such corrections are important for economies in general and are of particular relevance for China – many continuing errors in interpreting China’s economic growth turn out to not to be due to problems in China but to people using inaccurate measuring rods! Accurately measuring with the most advanced Western econometric methods, it is easy to show that China’s economic growth follows an entirely comprehensible pattern – confirming Deng Xiaoping’s assertion that China simultaneously follows an entirely specific path of development, its ‘Chinese characteristics,’ and the ‘universal laws’ of economics. These issues allow a clear understanding of the ‘universal’ elements of China’s growth, and therefore the lessons that may be drawn by other economies. The first key issue is the notable ‘openness’ of China’s economy – the results of its conscious process of post-1978 ‘opening up’. This, however, in turn is based on the determinants of economic growth in general and therefore applies to all economies. the contribution of intermediate input is by far the most significant source of growth in output. The contribution of intermediate input alone exceeds the rate of productivity growth for thirty six of the forty five industries for which we have a measure of intermediate input. Comparing the contribution of intermediate input with other sources of growth demonstrates that this input is by far the most significant source of growth. The contribution of intermediate input exceeds productivity growth and the contributions of capital and labour inputs. 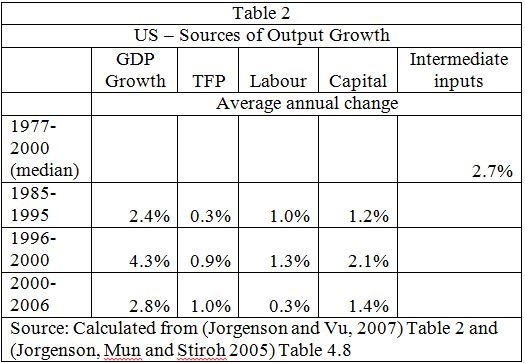 To illustrate this, Table 2 shows Solow’s original growth accounting categories – capital, labour, TFP – together with a column for growth of intermediate inputs. As may be seen, over the period 1977-2000, the median rate of growth of intermediate inputs in the US economy was 115% of the rate of growth of US GDP – far higher than any other input. This question of understanding the importance of division of labour makes clear, from a global/universal economic perspective, the significance of China’s ‘opening up’ policy. Division of labour is not purely domestic. The key trends in globalisation – rising share of trade in GDP, rising ratio of foreign direct investment to GDP, plus studies of particular industries – are all powerful evidence of increasing international division of labour. These realities therefore have immediate consequences for China’s ‘opening up’ strategy. In particular, the fact division of labour is the most powerful quantitative factor in economic growth immediately determines which development strategies will and which will not work. The consequences of division of labour being the most powerful factor in economic growth drives globalization and dooms ‘import substitution’ strategies – the latter being the dominant form of attempts to build up a self-contained national economy. A wide range of empirical studies supports the theoretical conclusion that more outwardly oriented economies achieve significantly higher rates of real growth of GDP. It is China’s rejection of ‘import substitution’ strategies that is the first feature of its economic policy. The success of China’s ‘opening up’ policy is so evident, and has been stressed by numerous authors, that it is unnecessary to give excessive detail here. It is however highly significant that China is much more open to international trade than the US. As Japan is the world’s third largest economy, it is also illustrative to include it comparisons. As shown in Figure 3, in 2012 China’s exports were 27% of GDP compared to only 15% for Japan and 14% for the US. Consequently China’s export sector is almost twice as large a proportion of its economy as is that of the US. That China is a much more open economy in trade than the US or Japan gives a competitive advantage over the US and Japan in promoting more rapid growth. China’s openness to foreign trade is also much higher than a number of other large developing economies. After division of labour, modern economic research shows capital investment is the second most important source of economic growth. This is of particular relevance to studying China, and economic growth in general, and therefore lessons of this from China are relevant for all economies. The finding that investment is the second most important force in economic growth, considerably exceeding the contribution of productivity, was seen not only in China but in all rapidly growing Asian economies – Asia being the only part of the world in which countries have gone from poverty to ‘first world’ living standards in a single lifetime. Analysing what created this ‘Asian miracle’ is therefore evidently of great importance not only for China’s but for economic policy of all countries. Very high capital investment accounted for 54% of the growth lead of developing Asian economies over the Western industrialized economies and for 62% of developing Asia’s lead over other developing economies. High capital investment was almost twice as important as productivity increases in explaining Asia’s growth lead over advanced economies. The study of Asia also confirms previous findings that as a country moves towards being an advanced economy，the role played by investment in its growth increases. This is shown in the chart below. Taking countries in ascending order of economic development, the percentage of growth due to investment is 50% in non-Asian developing economies, 55% in Asian developing economies and 57% in advanced economies. Growth in advanced economies is therefore more ‘investment led’ than in developing economies, and development to advanced economy status leads to growth becoming more investment intensive. These modern advances in the study of measurement and causes of economic growth, as well as the practical examples of China’s and Asia’s economic growth, settle the issue of the difference between two possible growth strategies, and also explain why the Western economies are relatively stagnant compared to China and the dynamic Asian economies. (i) The first strategy, the one confirmed by the facts, is that the primary force in economic growth is accumulation of capital and labour (factor accumulation) and that productivity (Total Factor Productivity – TFP), while significant is less quantitatively important than factor accumulation. This growth strategy was pursued in the developing Asian economies and above all in China. It has been a spectacular success, creating the fastest increases in living standards ever seen in human history, lifting hundreds of millions out of poverty, now creating `first world’ living standards in a series of what were originally `third world’ countries (south Korea, Singapore etc. ), and bringing China from a poor country to the brink of ‘high income’ countries by World Bank criteria. (ii) Alternatively, if the main locomotive of growth is believed to be TFP growth, then initiatives promoting factor accumulation (high saving rates, widening participation of the population in the work force etc.) are not so important as policies assumed to increase productivity. The facts confirm that the downplaying of factor accumulation (capital investment and labor development) in the advanced economies has been unsuccessful as a growth strategy. This is inevitable as TFP by itself is too small a part of the economy to create rapid economic growth. 1. China’s economic development has a unique and specific character – its ‘Chinese characteristics’. This unique character is, however, a specific combination of economic forces which are global in character. Those who created China’s economic policy, notably Deng Xiaoping, were therefore correct in their claim to be simultaneously following uniquely Chinese policies and to be operating according to ‘universal laws’ of economics. It follows that other economies cannot mechanically copy China but can draw clear lessons from its economic success. 2. The ‘opening up’ policy of China is rooted in the fact that domestic and international division of labour, reflected in the growth of intermediate products, is the most powerful force of economic development. Only an ‘open’ policy, that is participation in international division of labour, and not import substitution, can be the basis of rapid economic growth in any economy. 3. China’s pattern of growth driven by very high investment levels but corresponds to the general forces propelling economic growth. Capital investment is, after division of labour, the second most powerful force of economic growth. This applies in both developed and developing economies. For basic quantitative reasons, therefore, strategies based on TFP growth (e.g. promoting ‘entrepreneurship’) cannot be successful in generating economic growth – this explains the relative stagnation of the Western economies. This reality also shows the correctness of concepts, such as those of Justin Yifu Lin, that the key goal of development policy should be to alter ‘factor endowments’ so that economies for their development gradually make the transition from labour intensive to capital intensive production. This paper was presented to the G20 Summit Think Tanks meeting organised by Chongyang Institute for Financial Studies, Renmin University of China in Beijing on 3 September 2014. This is of course rapid growth by the standards of the relevant period. The different categories with ‘Chinese characteristics’ are from (Wen J. , 2011). The term ‘China Dream’ is of course from Xi Jinping. (Lin, 2012, p. 66) Emphasis deleted from the original. ‘the Chinese revolution succeeded by integrating the universal principles of Marxism-Leninism with the concrete practice of China, we should not demand that other developing countries, let alone the developed capitalist countries, adopt our model in making revolution. Of course, one cannot demand that they all adopt the Russian model, either. For a conceptual explanation of the changes see (Jorgenson D. W., 2009). For detailed technical studies see (OECD, 2001) and (OECD, 2009). See for example (Zheng, Bigsten, & Hu, 2009). The whole framework of this is a false assumption that the majority of world economic growth is due to productivity increases. See for example Lardy (Lardy, 1993) and Cao et al (Cao, Ho, Jorgenson, Ren, Sun, & Yue, 2009). Deng, R. (2002). Deng Xiaoping and the Cultural Revolution – A Daughter Recalls the Critical Years. Beijing: Foreign Languages Press. Deng, X. (13 October 1987). We Are Undertaking an Entirely New Endeavour. In Selected Works of Deng Xiaoping Vol. 3 1982-1992 (1994 ed., pp. 249-252). Beijing: Foreign Language Publishers. Deng, X. (21 August 1985). Two Kinds of Comments About China’s Reform. In Selected Works of Deng Xiaoping Vol. 3 1982-1992 (1994 ed., pp. 138-9). Foreign Languages Press. Deng, X. (28 August 1985). Reform is the only way for China to develop its productive forces. In X. Deng, Selected Works of Deng Xiaoping 1982-1992 (1994 ed., pp. 140-143). Beijing: Foreign Languages Press. Deng, X. (30 March 1979). Uphold the Four Cardinal Principles. In 2001 (Ed. ), Selected Works of Deng Xiaoping 1975-1982 (pp. 166-191). Honolulu: University Press of the Pacific. Deng, X. (31 May 1980). An important principlefor handling relations between fraternal parties. In X. Deng, Selected Works of Deng Xiaoping 1975-1982 (1984 ed., pp. 300-301). Honolulu: University Press of the Pacific. Lin, J. Y. (2012b). Demystifying the Chinese Economy. Cambridge UK: Cambridge University Press. OECD. (2001). Measuring Productivity, Measurement of Aggregae and Industry Level Productivity Growth, OECD Manual. Paris: OECD. OECD. (2009). Measuring Capital, OECD Manual 2009. Paris: OECD. Pyo, H. K., Rhee, K.-H., & Ha, B. (2007). ‘Growth Accounting and Productivity Analysis by 33 Industrial Sectors in Korea (1984-2002)’. In D. W. Jorgenson, M. Kuroda, & K. Motohashi (Eds. ), Productivity in Asia: Economic Growth and Competitiveness (pp. 113-145). Northampton: Edward Elgar. Vu, K. M. (2013). 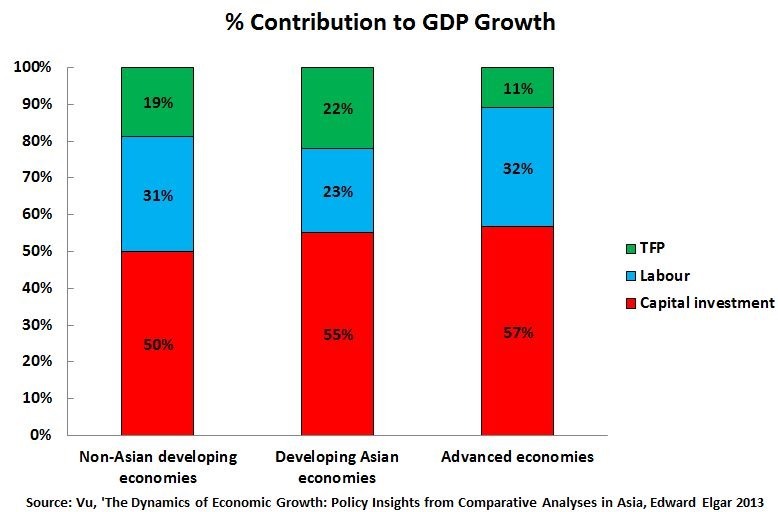 The Dynamics of Economic Growth – Policy Insights from Comparative Analyses in Asia. Cheltenham, UK and Northampton, M.A., US: Edward Elgar. Zheng, J., Bigsten, A., & Hu, A. (2009). ‘Can China’s Growth Be Sustained? A Productivity Perspective’. World Development, 37(4), 874-888.